Today, starting one’s career is an achievement, not an unmanageable dream. 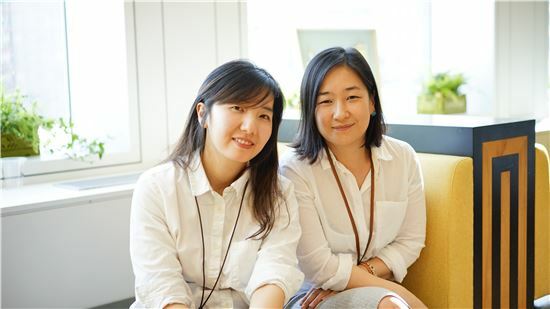 Choi Kyung-hee (Media Communication ‘99) and Kim Mi-hee (Advertisement Promotion, 01), co-president of Tutoring, developed a mobile learning platform that links English instructors one-on-one to students. We, at the Hanyang Journal interviewed Choi Kyung-hee and Kim Mi-hee, co-presidents of Tutoring a venture that is growing rapidly. Q: What was your campus life like? Kim : I was not the best student. I believe my year off after my freshman year was the year that changed me the most. Almost all my friends went to study abroad, but I worked in a game producing and web design firm. That was my first experience in the IT field and that was when I started to seriously consider starting a business. From then on, I became the student who enjoyed participating in marketing idea contests. I made sure that I learned from my failures that I experienced during my time as a university student. Q: What made you think about starting a company? Choi: This is my third tine starting a business. While working for a company called “Paul and Mark” I started a small company. That experience helped me to understand the members of an organization and what really goes on when people gather. After Kim contacted me with the idea of starting a business, I saw the possibility of mitigating inconveniences in the education field which ended up in starting a tutoring business. Kim: I personally had a hard time communicating with global branch managers while I was an office worker. I was also surrounded with those who had foreign experiences and felt disappointed with my English skills. On-demand learning platforms and tutoring was a business idea that was rejected in the idea contest but I held on to it. After specifying the ideas and building a prototype I finally got some positive reactions. Q: Were there any difficulties starting a tutoring business? Choi: Bringing the education business from ann offline to online platform was a challenge. It was hard because the concepts that I thought I knew did not always worked on an online platform, which was the reason why I had to build a whole new different concept. Also, since I had too much things to do, it was hard to manage my time. Kim: The most important thing to consider when starting a business is how quick you adapt to changes. You have to be quick on your feet which are why I think the most challenging obstacle that you have to go through is that you cannot afford to relax. Kim: It all started with me suggesting a business model. Choi gave me much feedback which in the end helped the business turn into a success. I, with more than 10 years of career in the IT business, and Choi, with more than 10 years’ experience in education, had our differences. However, the differences we had to deal with became the premise for new innovative ideas. Q: What would you been doing if not starting this business? Kim: I probably would have had an ordinary life as an office worker for Samsung Electronics or any other company. However, I would not have been satisfied because my interest always lied on developing new service models. I think I would have always searched for innovating models during my spare time as an office worker. Q: Lastly please tell us about your goals and plans. Choi: It's my goal to develop my ideal education model through Tutoring and travel to countries where education is a rare opportunity. I wish to build an educational program there for young uneducated girls. Kim: In a long run, our mission is ‘to eliminate the barriers for new learning'. Nowadays global online tutoring is a huge market, it’s size estimated to be about more than 200 trillion won. Pre-existing services are 1:1 offline tutoring sites and it is expected that offline tutoring market will rapidly expand into mobile environment. This moment our goal is that Tutoring will lead the global mobile tutoring market with services optimized for the mobile phone.